Our giveaway for a SodaStream Machine may have ended, but that doesn't mean that you don't have time to shop and get a great deal on items from Soda Stream. 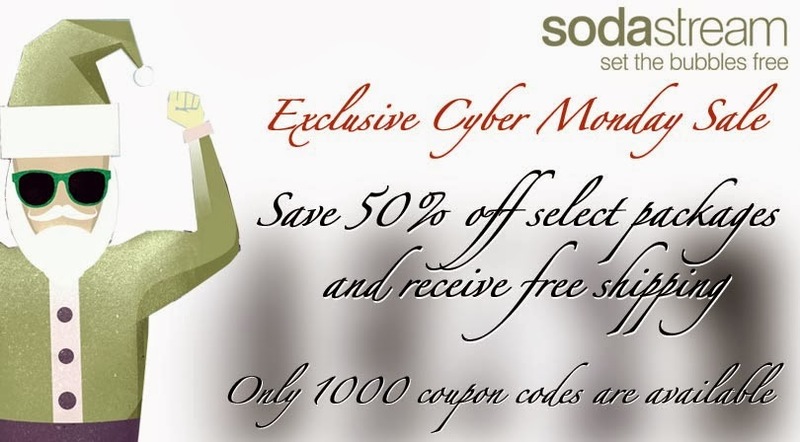 If i'ts for yourself or a gift for a family member or friend, head on over to Soda Stream Canada because they have a great Cyber Monday deal going on where you get 50% off of select packages and FREE SHIPPING! Hurry on over, there's only 1,000 coupon codes available. Also be sure to order before Wednesday, December 18th to ensure that you receive your order just in time for Christmas! The coupon is for Canadian Residents only, so head on over to their Facebook page and get your code before Cyber Monday ends!